While everybody arrived and took their places, the Bath Spa Band played. 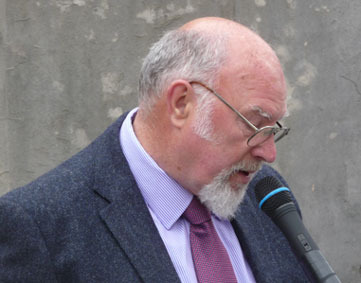 The welcome address was given by Brian Vowles, the Project Chairman and one of the Project's co-founders. He reminded those present that as well as those who were killed in the raids and are remembered on the memorial there were others who were affected, sometimes fatally. He gave as an example a lady staying in the Grosvenor Hotel in North Parade who had a heart attack during the bombing and because the Bath hospitals were overwhelmed with casualties she was taken to Savernake Hospital where she died on 10th May 1943 and was buried just outside Marlborough. 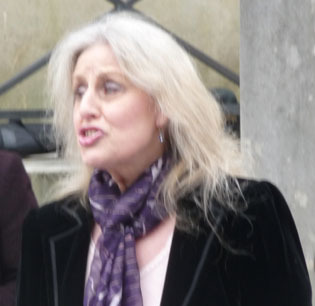 Nevertheless, she was as much a victim of the attacks on Bath as those listed in the local records, and she and others like her, for there must have been other similar cases, should also be remembered today. The fragrant silence of the night was shattered by the siren's wail. The boom of guns broke in upon the singing of the birds. Were outshone by bursting rockets falling in a crimson rain. Became a roaring field of battle blazing round the young white moon. The fighters passed - the stars came back - the drone of engines died away. The birds took up their song and sang till the break of day. A Blessing and Prayers were offered by Edgar Evans. 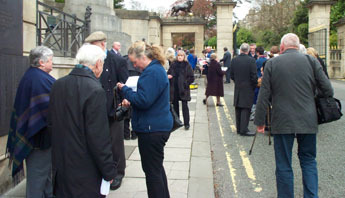 Prayers were then offered for the victims of the Bath Blitz and for their relatives who honour them; prayers in appreciation of their lives and values; prayers for the triumph of good over evil; and prayers for those who suffered yet survived, for those who died, and for their families and friends who remember them. by Mimi Bouchaud and James Butters. 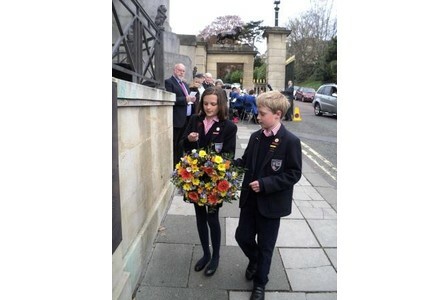 The two who laid the wreath this year in memory of the 417 who died in the bombing of Bath are Head Girl and Head Boy from Paragon School. 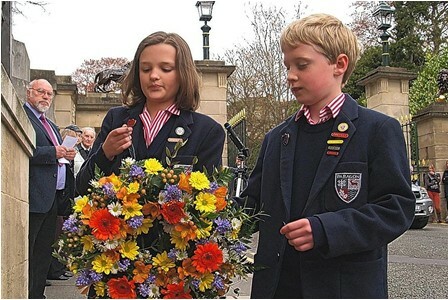 While the wreath was laid, the Bath Spa Band played "Abide With Me". By 1942, senior boys at my boarding school in south London were much involved with extra-curricular activities such as fire watching, first aid training and the Home Guard. Many of the members of the teaching staff had left to join the Services and the constant air raids both by day and night severely interrupted our school work. In the hope of a break from the air raids I arranged to spend the school Easter holiday with my Grandmother (nominally my guardian) who had moved out of London at the outbreak of the war and was now living in Bath, a city which I did not know but believed to be safe. Needless to say, this was the very time the Germans decided to attack the city. I realised that the training I had received in London might well be useful. I was 17 at the time and I was given a Home Guard uniform which I put on and cycled into the city. There I found myself in a devastated area where a bomb had made a crater in the road, a gas main had broken and the escaping gas set on fire, the surrounding houses had collapsed and others damaged. I set to helping to clear the rubble and searching for possible survivors. I left at about dawn to find my grandmother and aunt who lived with her safe and sound in the undercroft of their house but unable to get into the house proper because the door was jammed. On the second night I turned out again and spent my time helping fire crews. I think that it was whilst I was doing this that an aircraft gunner fired several bursts at us. Fortunately his aim was not good, as I am here today. Following the raids, it was evident that there was a lot of work to be done. I thought I should explain where I was and I sent a telegram to my school saying I would be late back and spent the next week patching up my grandmother's house and helping to clear rubble and recover victims of the raids, before returning to London which was quite peaceful compared to my "holiday" in Bath! 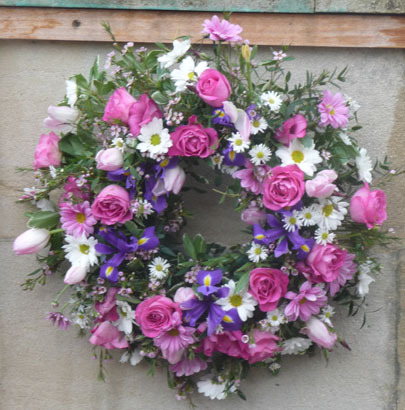 The wreath was kindly donated by Paragon School. 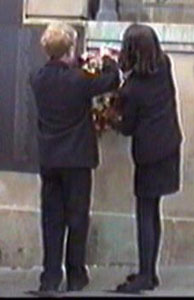 The school has placed a news item on the service and the laying of the wreath on their own website. Bryan Vowles extended thanks to The Bath Spa Band, and to the Paragon School. He also thanked those who had attended this year's service and gave the date (27 April 2014) of next year's event. The Bath Spa Band played a selection of popular wartime tunes as everybody dispersed. Click here for information about the plans for the 2014 ceremony. A minute's silence was held this afternoon to remember the 417 Bathonians killed during bombing raids on the city. 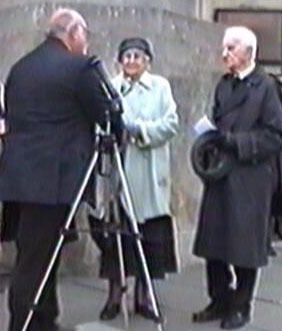 People who lived in the city during the Second World War, joined by younger generations, paid their respects to those who lost their lives in April 1942 when Bath suffered three nights of bombing by the German Luftwaffe. 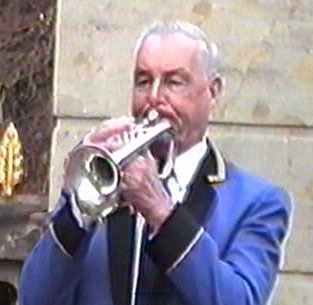 The silence was part of a short service organised by the Bath Blitz Memorial Project which included prayers and the Last Post played by Bath Spa Band. 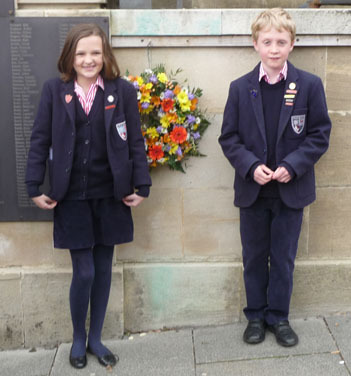 A wreath was also laid by two students from the Paragon School, head boy James Butters, 10, and head girl Mimi Bouchaud, 11. James said: "I think the service is a good idea because it shows that Bath was affected during the war." Mimi added: "It also shows these people that were killed were an important part of the city and have not been forgotten." This year's service focused on the experience of Alan Reid, who aged 17 came to Bath in April 1942 to stay with his grandmother during a school holiday. He travelled from London to escape the bombing but because of first aid training he had received at school soon found himself in Bath's Home Guard and helped to rescue people after the bombings. Now aged 88 and living in Bathford he said: "I didn't know anyone who was killed or involved but of course it brings back many memories of people in distress, trying to help, moving rubble and that sort of thing." The service also had two special visitors, mother and daughter Miriam Connolly and Mairead Nichonghaile, from Ireland who were descendants of Father Timothy Sheridan who was in St John's Church and was killed when it was bombed on April 27, 1942. 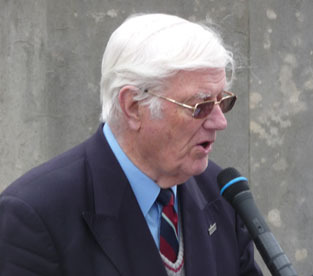 Mrs Connolly said: "It's an opportunity to come and remember my uncle, and pay our respects." Next year's memorial service will take place on Sunday, April 27.